Along with planting the seeds for a new museum and protecting 18th-century architecture, Melina Mercouri (“the Last Greek Goddess”) commissioned the start of what was to be one of the world’s best open-air museums: a traffic-free, uninterrupted pathway encircling the most sacred ground of the city. Through her role as beloved actress in the 1950’s and 60’s, and later as a cherished politician in the 80’s and 90’s, Mercouri’s presence still sparkles sixteen years postmortem. After rounding the world, successfully inspiring support for Greece and eventually overthrowing an oppressive dictatorship, she claimed the seat as Minister of Culture where she fostered dazzling measures to maintain the country’s culture, “Greece’s heavy industry,” in her own words.
] 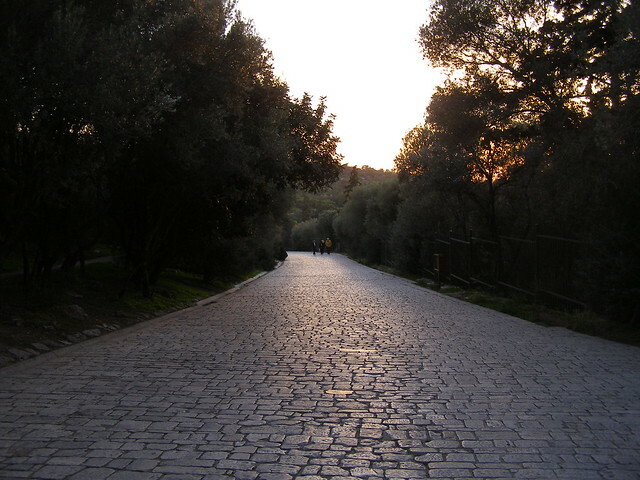 The pathway starts on Aeropagitou Street, just opposite the Temple of Zeus. An inviting stretch of cobblestone rolls out for strollers, street performers, nut/koulouri vendors and the occasional police patrol to share the path without the pesky brushing of elbows (or full-on collisions of bodies) somewhat common elsewhere in Athens, population a cool five mil. The left side is dominated by the area’s latest architectural wonder, the New Acropolis Museum, while the right side is a hill of pine, laurel, and eucalyptus trees crowned by the Acropolis. Nestled high in the most coveted location of Athens restaurateurs, Dionysus Zonar’s is just opposite the main traffic ring; an endless river of taxis and tour buses fighting for space to pick up or drop off clients. At the end, straight ahead, is the entrance to Philopappou Hill (marked by barriers) and to the right a paved turn that connects Aeropagitou to Apostolou Pavlou and the neighborhood of Thissio. Metros are found just around the corner from Areopagitou and in Thissio. The action picks up on Apostolou Pavlou. Walking the entire length of the road (2.5km or 1.5 miles) should take around two hours, providing ample gawk time. Starting from Areopagitou and ending where Apostolou Pavlou connects to lower Ermou, you see five of the city’s most extraordinary highlights: (in order) the theatre of Dionysos, the Odeon of Herod Atticus, the Acropolis, Ancient Agora, and the Keramikos Cemetery. In the golden afternoon the cafes swirl with life and the buskers are jamming their hearts out, audience or no. When it’s dark, the twinkle lights and street lamps glow like torches, keeping the mood easy and safe, even late. The middle of the day in the summer, on the other hand, is a ruthless time to be on a road that’s completely without shade or nearby taxi cabs to rescue you with a blast of air conditioning. Two other notes of annoying reality include dealing with the lawless motorcycles and the cruising law enforcement, often circling the area to chase away illegal immigrants who have set up shop on the road. Still, the place offers the best things the city has to offer: magic, music, year-round green, the waft of pine and eucalyptus, a bold presence of an ancient civilization and the gifts of goddesses.